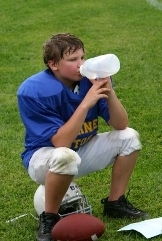 "Exertional heat illnesses are largely preventable within the confines of organized sports when appropriate protocols are put into place," said Douglas J. Casa, PhD, ATC, FACSM, FNATA, chief operating officer of the Korey Stringer Institute, director of Athletic Training Education, Department of Kinesiology at the University of Connecticut and chair of the position statement writing group. [Note: Casa is also a member of MomsTEAM Institute's Board of Advisors, which is developing best practice guidelines, including on exertional heat illness, as part of the Institute's SmartTeams Play Safe initiative. "This includes heat acclimatization, body cooling, hydration, modifying of exercise based on environmental conditions, among other considerations. These guidelines are not just for athletes - they are also valuable for individuals exposed to warm weather environments such as those in the military or individuals whose work necessitates heat exposure." Exertional heat stroke is one of the three leading causes of death in sport (and the leading cause in the summer). The period of 2005 to 2009 had more heat stroke deaths than any other five year period in the 35 years prior. There were 18 deaths from 2005 to 2009; from 2010 to 2014 (still being tracked) there are now an estimated 20 to 22 deaths. A pre-season heat acclimatization policy should be implemented to allow athletes to be acclimatized to the heat gradually over a period of 7 to 14 days. This is optimal for full heat acclimatization. The goal for any exertional heat stroke victim is to lower core body temperature to less than 102.5°F within 30 minutes of collapse. Cold water immersion is the most effective way to treat a patient with exertional heat stroke. The water should be 35-59°F and continuously stirred to maximize cooling. These recommendations vary slightly from those made in a 2009 position statement on heat acclimatization. The current document now states that a patient suspected of having exertional heat stroke must be cooled via cold water immersion for the full treatment time prior to being transported to a hospital; and that this must be stated in the school's emergency action plan. A substantial revision of tables and figures have been amended to provide more clinically-applicable information. Hyponatremia was removed from the current guidelines as this condition is not considered to be a true heat-related illness. "Death from exertional heat stroke is 100 percent preventable when proper recognition and treatment protocols are implemented," concluded Casa. "Putting the right programs into place is essential to prevent and treat exertional heat illnesses and ensure appropriate care is in place." * The updated position statement is now slated to be released in August/September 2015, according to Casa.